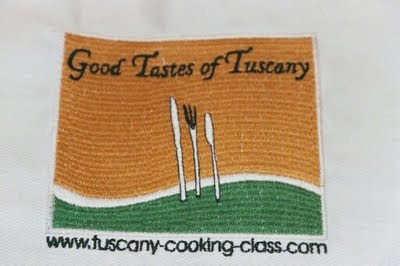 With only 2 more days left in the Italy Adventure, Mom and I were off to our Good Tastes of Tuscany Italian Immersion Advanced Cooking Class. All day of cooking, eating, and drinking. We were picked up at the Hotel Hell, and driven out to the 13th-century Villa Pandolfini, which is surrounded, by olive groves, vineyards and gardens. Native Florentine Chefs Lisa Banchieri and Maurizio Moretti greeted us. After having a cup of espresso and visiting the gardens, we were presented our menu that we would prepare. Fettunta (meaning oil sliced) - an type of Toscana crostini Stracchino & Sausage Crostini Artichoke and Ricotta Ravioli Stuffed Chicken Thighs in Crust Dolce Forte - Caramelized Cipolini (Caramelized Small Onions) Tiramisu (meaning pick me up) 'Nuff said. 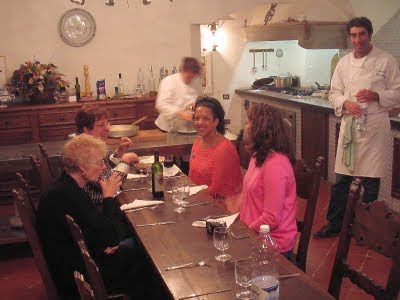 We learned how to make everything from scratch, including making pasta and pizza crust, making a dough to cover meats, making the best tiramisu in the world and drinking a whole lot of wine. We received an apron and all of the recipes to make at home. Can you say "Dinner Party!”? for Fontinini statues and found a small store that sold them but not a lot of selection. Found some Murano and Venetian glass. Bought some doo dads, had another gelato and headed back for the hotel. I thought I was going to get beat up by a street vendor for stepping on her sheet that she had laid out in the middle of the sidewalk. Mom and I ignored here as she ranted and raved about me stepping in her territory. Whatever. We arrived back at Hotel Hell to be greeted by 3 tour buses of people. Retreating to our room, I tried to order room service, but they didn't answer the phone. I ended up walking around the corner to a little booth that sold snacks. We ended our culinary adventure with two beers and a can of Pringles. Accademia Gallery (the art of Michelangelo) in the morning, a guided visit to the Uffizi Gallery (works of art by Botticelli, Michelangelo, Leonardo da Vinci and more), and then end our day with Florence by night with dinner, music and dancing.